Well, by now you probably already guessed it. The answer to that question would be a BIG NO!! 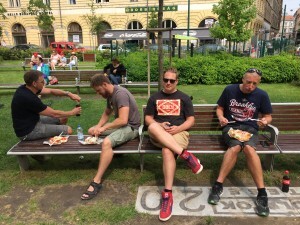 With that said and done, our bellies were full, pictures of Budapest taken, we set off for Slovakia. This was supposed to be a 3 hour drive, it ended up being a 6.5 hour drive, imagine that…!? At least half of it was still in daylight so we could at least enjoy the scenery, but the other half was just dark and on top of that it started raining heavily which did not by any means increase our speed! So, picture this, 5 by now tremendously hungry Swede’s are driving along in more or less no-man’s-land after just having crossed the border into Slovakia. There is absolutely nothing around. All of a sudden we drive through a village, well a couple of houses at least. I almost did not even notice it was so small. But the hungry eyes of Aron did pick up a scent, a PIZZA sign. Let there be light and lord be hold, what in the earth is a pizza place doing out here in the middle of nowhere??? No time for asking irrelevant questions at this point. Imagine the surprise of the owners when 5 hungry Swede’s rock up to the counter asking for pizza’s. Probably the best tasting pizza in decades! Belly’s full again, off we go, arriving at our destination a few hours later. A very, very nice little hostel in another tiny little village. Licking our wounds from the long drive, but still in super high spirits, it’s bedtime. Next day we set our sights for the Opal mine. Now that we could actually see the scenery around where we were driving it was beautiful. Mountains and forest as far as the eye could see. Arriving at the mine we met Peter who drove down from Bratislava. He was the guy to show us around for the next couple of days. 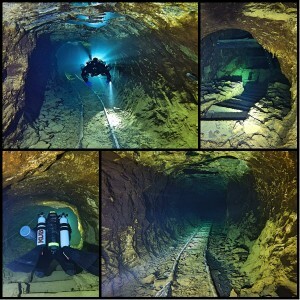 After a long and very thorough intro/divesite briefing/ getting to know one another chat, it was time to head down into the mine for the first time. Up until this point on the trip we had been fairly spoiled I would say. We have had close access, easy entry/exit, logistical setup for equipment. Well, now the coin had flipped. Back to old school hauling equipment like never before. The intention is to keep the mine as intact as possible, which means there is more or less no improvements made since they shut down the mine about 200 years ago. So you can probably imagine this is no fancy cake walk to reach the water level, a fairly good distance away from the actual ground entrance. Somehow miners back in the day tended to excavate just enough rock to be able to pass thru. This does not mean a person of normal height can stand upright at all times. 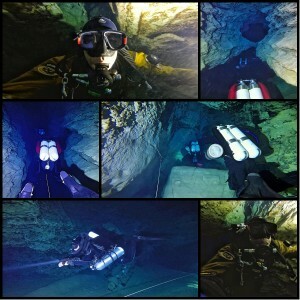 It took us a while to get situated and setup, then it was time for the first dive. After another thorough dive briefing and making a good plan, we hit the water. Coming from the 28 degrees Molnar Janos water, 3 degrees was a bit of a wake up. For sure you can all imagine we switched to the THICKEST undergarment’s and dry gloves. Only a few minutes into the dive I suddenly realise it was all so worth it. All the effort of actually getting here paid off more than I could have imagined! I’ve been diving for a long time and in various places around the world, but never have I seen such colours as in this Opal mine! Truly spectacular and one of a kind! I didn’t feel the cold, I didn’t feel my body aching from hauling a gazillion kg of dive equipment down the mine, I could not have cared less about Google Map’s tricking us in time vs distance. I am just completely amazed at where I am, looking at these colours, thinking about when the miners last walked around here looking for Opal. I can safely say that everyone was in high spirits, and enthusiastic like never before, just wanting more off this! Of course to complete the circle and putting that last dot over the I, there can’t be awesome diving without a good barbecue. And what better place is there to be than Slovakia in this case. The sausage’s they make in Slovakia are not even possible to describe in words, they need to be tasted. Now, how do you think a few divers start a fire when they are hungry and don’t really want to wait around too long? Easy, O2 is the key! Obviously we did bring O2 for deco. O2 + lighter = big fire in no time! And we have an entire forest surrounding us for firewood. Over the next days to come we made some amazing dives, one more astounding than the other. So many levels and areas to explore! What still amazes me is the colours seen, of course powerful video lights was definitely a big help to get those colours! And that pretty much concludes the Eurotrip -16. After having made the last dive we set our sights for the ferry in Rostock, Germany, taking us back to Sweden. From Slovakia crossing into Poland, and then Germany. About 1200km to drive, a few stops here and there for gas, dinner and most importantly coffee, but other than that we managed to do it over night. Arriving in Rostock at 4am with about 2 hours to spare until the ferry leaves. I call that time management deluxe and uniquely planned! Now summer has come to an end and new adventures await back “home” in Mexico. Tacos and caves, what could possibly go wrong…! And so the journey continues! The Viking team gathered, sights are set due south for central Europe, Budapest Hungary to be exact. After returning from the Mumin Valley in Finland, this adventure also originates from the center of universe, Malmö Sweden. First leg of the trip involved a ferry crossing, by far not as adventurous as the ferry to Finland and for sure not equally as long at only 6 hours. Enough time for a dinner and copious amounts of coffee while chitchatting with high hopes of the upcoming diving in Molnar Janos cave. The Ferry arrived in Sassnitz Germany at around 22:00 the same evening. Fueled up on coffee we decide to take the manly and only approach to the journey, stretch driving more or less straight south. Of course the driving involves a few short stops here and there. 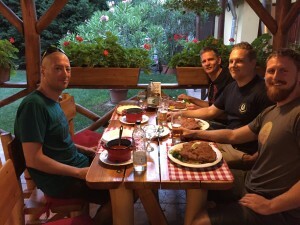 I mean what would driving around in Europe be without the occasional curry wurst and coffee stop…!? Traveling through Germany, Czech Republic, Slovakia and finally crossing over to Hungary we arrived in Budapest around noon the following day. The sun was shining, airtemp sat between 25-30 degrees, and it was awesome to be back in the city! It was an easy and smooth drive to the hotel, which by the way was literally a stone throw away from the cave. With diving scheduled to start the following day we got installed at the hotel and took a stroll down the street to look at the cave entrance. Now, I’ve been in Budapest several times, and I’ve been walking on this street numerous times before, always looking thru the Plexiglas at the small lake outside of the cave with a humongous craving for diving this cave, finally the time had come! 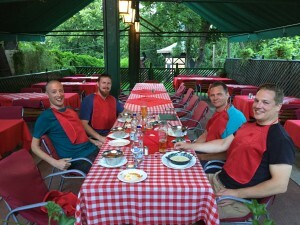 Rounding off the first evening with elephant ear sized schnitzels we were set for some well deserved sleep. Waking up the following morning, the expectations alone could probably move mountains, at last, time for some city cave diving! So if it’s not been clear enough or if you don’t know about the this location, this cave sits in the middle of Budapest city, right next to the Duna river, literally you are swimming around underneath the city center. There is a great parking just inside the gate next to the small lake. In terms of logistics the guys running this place has hit the home run. Big parking, wheelbarrows to haul equipment inside the cave, with a nice paved stretch leading up to the water part of the cave. Once inside there are super solid equipment storage with everything you could possibly wish for. A long stretch of metal benches for holding all the doubles and CCR’s in perfect height for getting dressed. A mega large map of the entire cave system giving you a perfect opportunity to plan each dive in detail, at the moment there is 7km of explored cave passage, and the most important thing, the possibility to make coffee! A few steps of stairs led down to the water surface which ended in a solid metal platform. In the middle of the small “lake” inside the mountain there is a buoy which went strait down to the permanent line and eventually the cave entrance. Also situated in the lake, was nice rectangular permanent deco station placed at 6M. Perfect place to stage the O2. You can probably imagine the fuzzy feeling after coming from the chilly Mumin Valley, to jump into water at a temperature of 28 degrees (First 10M’s are at 28 and then it “drops” to 21 degrees below 10M. So, once again spoiled by water temp). Time to get cracking then. After a solid run-through and detailed briefing, it was time for the first dive. Slowly descending down the warm layer of water, starting to follow the permanent guideline I was suddenly once again struck by the thought of swimming underneath the busy city life going on just above our heads. 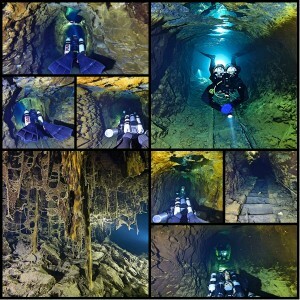 Molnar Janos is a Limestone cave with fairly large passages in comparison to a lot of other places I’ve visited and dived. Using doubles for backgas and multiple stages was not in any means a problem to navigate through the cave. I would also call this a very scooter friendly cave. We were surrounded by beautiful crystal and limestone formations, some rooms we entered were humongous, some passages slightly smaller, but never “tight”. If you went off the “beaten track” for sure you can find some tightish spots as well, but in general, it’s big. 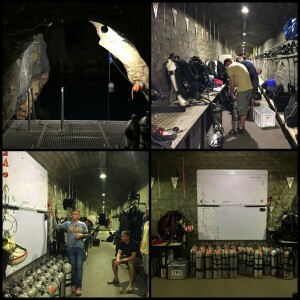 In terms of logistics and diving everything had been made to really accommodate cave divers! And the diving itself is amazing. 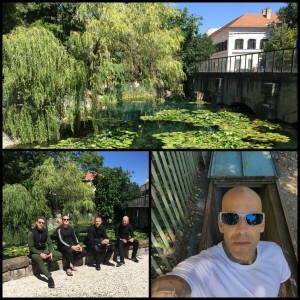 The beauty of diving in a capital city in central Europe is of course you’ll have the entire city at your disposal when you are not diving. One thing you can find a lot of here is truly amazing food! Of course every restaurant each evening was carefully selected and thought thru, like I said, I’ve spent some time in this city before, know my way around. After 3 great days of diving the time had come to load our cars and change location again, sights set for Slovakia. I really have to complement the guys at Molnar Janos for excellent service, superb logistics and a super solid and smooth setup! Your plans for the future will only make things even better so keep up the awesome work! According to the super all mighty Google maps (ppfffffff), the journey between Budapest and our Slovakian destination was only supposed to be a 3ish hour drive. So why not take the opportunity to stuff our belly’s full of proper Hungarian langos and make some traditional selfies like every other tourist does?? … Hey, I mean we have time, it’s only early afternoon, and it’s only a 3 hour drive right? Just going to throw this out there so you have something to think about before reading Part III of this trilogy. Do you think Google maps has any clue to time management in terms of distance??? Well, I’m gonna sit on that answer for a while, give you some time to reflect, haha.